New Brunswick/Hamilton, N.J. – Rutgers Cancer Institute of New Jersey and Robert Wood Johnson University Hospital Hamilton (RWJ Hamilton) have announced the appointment of breast surgeon Firas Eladoumikdachi, MD, FACS, as Program Director for the Rutgers Cancer Institute of New Jersey at Hamilton – the cancer center at RWJ Hamilton. He will be responsible for clinical leadership of the oncology service line at RWJ Hamilton including medical, surgical and radiation oncology. “Rutgers Cancer Institute of New Jersey has the ability to provide patients at affiliate locations like RWJ Hamilton access to unique oncology services that may not be available at traditional community hospitals. Dr. Eladoumikdachi’s strong interest in clinical research and knowledge of both campuses will afford patients in the Hamilton region an opportunity to receive such services, as can only be provided by a National Cancer Institute-designated Comprehensive Cancer Center, while remaining close to home,” adds Rutgers Cancer Institute Interim Director Bruce G. Haffty, MD, who is also professor and chair of the Department of Radiation Oncology at Rutgers Cancer Institute, Rutgers Robert Wood Johnson Medical School and Rutgers New Jersey Medical School. A resident of Montgomery Township, Eladoumikdachi is an assistant professor of surgery at Rutgers Robert Wood Johnson Medical School. He has been with RWJ Hamilton and the Stacy Goldstein Breast Cancer Center at Rutgers Cancer Institute in New Brunswick for the past year. Prior to that, Eladoumikdachi served as the director of the breast program at Genesis Health Care System in Ohio and vice chair of Ohio Integrated Care Providers. 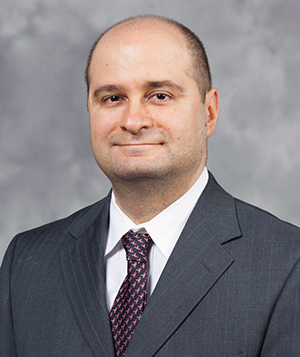 He completed his fellowship in breast surgery at the Lynn Sage Comprehensive Breast Center at Northwestern University in Chicago and his residency in general surgery at Baylor College of Medicine in Houston. Robert Wood Johnson University Hospital Hamilton (RWJ Hamilton) is the first of two New Jersey hospitals to receive the Malcolm Baldrige National Quality Award. Located in Hamilton Township, NJ, the hospital is part of RWJBarnabas Health and is affiliated with The Rutgers Cancer Institute of New Jersey. The RWJ Hamilton Health Care Corporation serves communities within a five-county area and includes an acute care hospital, The Rutgers Cancer Institute of New Jersey at Hamilton, affiliated medical groups, five Lakeview Child Centers, and the RWJ Hamilton Center for Health & Wellness. For more information, visit rwjhamilton.org.